Summary: The opening spread shows a busy day in Central Park; turn the page to see the swampy, rocky landscape of the early 19th century. How did this transformation take place? Architect Calvert Vaux and park superintendent Frederick Law Olmsted teamed up to create the winning entry in New York City’s contest to design a new park. Their scale-model drawing was ten feet long and so detailed that they almost missed the deadline. The first part of the park, the lake, opened in 1858. From there, they moved on to paths, bridges, and a children’s area. Olmstead worked carefully to select and plant trees, keeping in mind what they would look like for the next century. After their success creating Central Park, Vaux and Olmsted moved on to design many more green spaces throughout America. Includes additional information about these two men; questions and answers that provide more tidbits about the park; an author’s note, and a bibliography. 40 pages; grades 2-5. 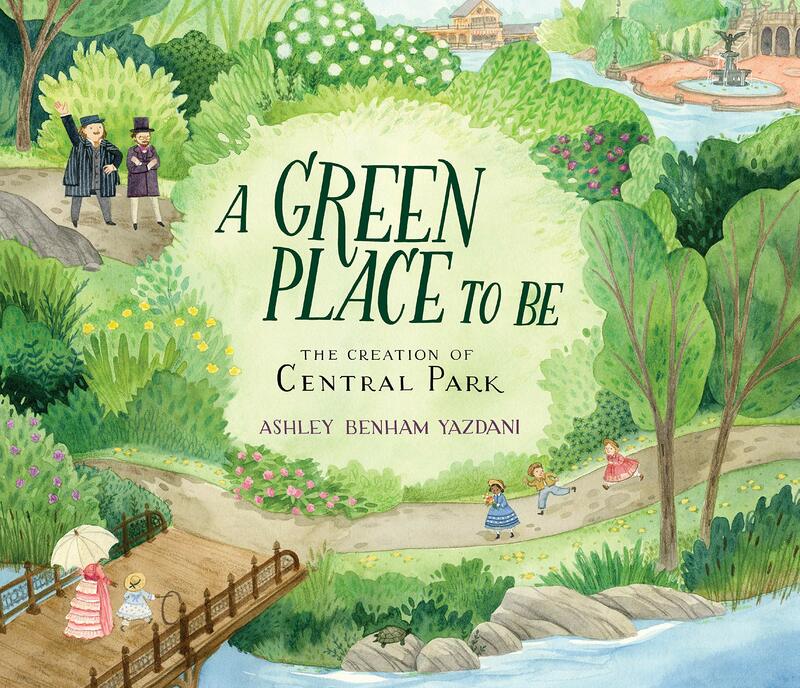 Pros: Ashley Benham Yazdani’s debut picture book is packed with fascinating information and beautifully illustrated with detailed ink and watercolor pictures. Cons: I was wishing for a list of the parks Calvert Vaux and Frederick Law Olmsted created. My Seneca Village by Marilyn Nelson would be an interesting book to pair with this one. It is a collection of poems that tell the story of Seneca Village, a multi-ethnic, multi-racial community in Manhattan that was claimed through eminent domain to create Central Park.